Where was this custom previously documented? Why did people want to document it in the first place? What does this tell us about the meaning of the custom? What does this mean? Knowing this goes a little way to understanding the perspective of those who documented wassail in the early days of folklore and popular antiquities study. It answers some of questions 1 and 2 above. So what does this tell us about wassail, and what it meant to those who documented it? It means we should always be a little wary of taking their descriptions at face value. Is wassail actually a relic of a pagan fertility custom? Or is that what the observers in the Enlightenment wanted it to be, due to their own biases of class, religion, and education? Further, could their informants – the regular folks telling them about the customs – be yanking their chains or manipulating the information given to these early scholars for any reason? It is impossible to know anything for certain, but by reading between the lines, we can make more nuanced interpretations about the place of this custom in history. History is not a case of fact and fiction, but of documents and interpretations of the content and creation of those documents. Here is one selection from John Aubrey’s early collection of popular customs Remaines of Gentilisme and Judaisme written between 1687 and 1689. 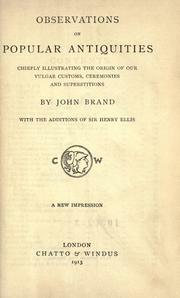 Writing slightly later, the antiquarian John Brand, one of the rationalist Protestant clerics, documented these wassail customs in his book Observations on Popular Antiquities: Chiefly Illustrating the Origin of Our Vulgar Customs, Ceremonies, and Superstitions, which was first written in 1777 enlarged and edited by Sir Henry Ellis in 1813.There’s lots more in the library, and you can wend your way around Google Books for many of the older texts. For more information about the early Antiquarian folklorists in England, check out The British Folklorists: A History by Richard Dorson. This entry was posted in History, UK, Wassail. Bookmark the permalink.